“Bura na maano, Holi hai!’ may be the perfect excuse to roll around in heaps of colours and look like a human rainbow on Holi. But, we know all too well the stares we get the next day, when we walk into work looking like a science experiment gone wrong in a human testing laboratory! 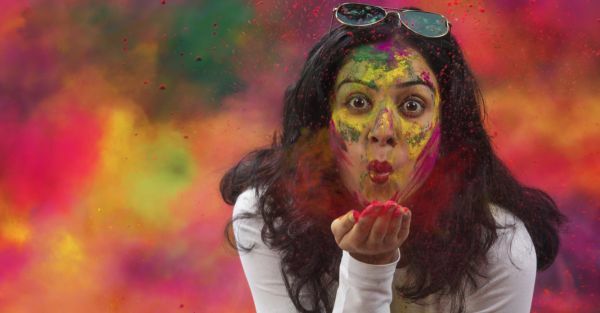 If you’re someone who can’t resist a fantastic Holi, but fear for your skin and your body the next day, here’s a wholesome guide on everything you need to do before the big day comes close! 1. Get to oiling your skin ASAP! Get your skin as greasy and as slippery as possible, so that the colours don’t get a chance to either permeate or stick on the surface of your skin. A thick layer of coconut oil can do wonders for your skin, as it won’t just hydrate your body, but will help colours wash away faster. We may have started off by celebrating Holi with eco-friendly and skin-friendly colour, but stores around the country have taken to mix harmful chemicals in the making of Holi colours so that they appear brighter and mix faster with water. These colours, while great-looking, are the worst when it comes to getting them off your skin. Some are even harsh enough to cause allergic reactions, if not taken care of properly. As we slowly inch towards the warmer months of the year, it’s important that you take care of your body, especially during Holi. Keep drinking water, glucose, juices - anything that will help you re-energising yourself. Dehydration can cause your skin to dry and that, combined with harsh chemicals of the colour, might seep into your skin, can cause problems later. For someone who wears contact lenses regularly, it is highly advisable that you take them off before playing with colours, as your eyes can get irritated if you get colours in them. Wearing shades will not only protect you from the sun, but it can also prevent the colours from going anywhere near your eyes and causing inflammation. 5. Paint a rainbow, but stay green! This has been drilled into our heads for years now, but still remains such an important message for people everywhere. Water is one of the rarest and fastest depleting resources that the world is fighting over right now. As people living on this planet, it is our duty to preserve the earth in every little way that we can. Leave your pichkaris at home and go dry this Holi - the planet will thank you for it! When it comes to Holi, your old clothes are the way to go, for sure. But it’s also important that you don clothes that cover most of your arms, legs, and even your face, if possible. Opt for full-sleeved fabrics, old denim jeans, and even long pyjamas for your fun in the sun! As much as we’d love to recreate Mr Bachchan’s iconic Rang Barse sequence in front of our friends, it’s important that we realise the side effects that bhaang can have on our health. When consumed in large quantities, it can lead to increased blood pressure and a hike in heart rate - both of which can put a damper on the festivities. So, drink bhaang responsibly, y’all! And not just for your skin! Your hair and your eyes need just as much prevention as the rest of your body. Maybe consider an intense oil massage for your head and opt for hats, bandanas, headbands and other fabrics to partially or completely cover your head. 9. Stay aware - not everyone is a fan of colours around you! Especially pets, strays, and innocent animals that want nothing more than to stay away from the busy streets and the boisterous human interaction! Of course, it goes without saying that one has to respect everyone around them when it comes to playing with colours, or throwing water balloons. Be kind to everyone - always! 10. Get some nourishment on board! Avoid celebrating on an empty stomach, and use the occasion to munch on all of your favourite treats this Holi! Take special care not to consume alcohol, coffee, or any other beverage that can cause dehydration, since you need all the water you can hold for your skin to behave. Go for fresh fruits, energy drinks (to regulate your body’s toxins and replenish fluids), plenty of carbs (since you’re going to burn them as you celebrate), and anything else that will help you have a fabulous time! Stay tuned for our AMA session on the PopXO App on 28th February, 2018 as our experts come together to share the secret #HoliGrailByPOPxo with you all. Ask us anything about how to play a skin-friendly Holi, if you should wear white, pre-Holi haircare, and much more from booze to beyond. Here’s wishing you a safe and happy Holi!